"The Final Fate of Earth 2" - Part Three: "Metropolis Underground"
Huntress, Batman and Boy Wonder (John Grayson's new codename for now) are underground with Sergeant Steel, who is part of a movement to bring down Central Control, an Anti-Wonder government that sent the Sandmen after the various heroes when the world rebooted in the previous issue. The Dark Knight's group is being shielded from Central Control's scans until John senses that they about to be found. Steel misunderstands this, believing Batman's group to be spies. Conflict ensues, and as his back is facing the reader, the Caped Crusader is shot by Sergeant Steel. Whether the Batman is dead or alive remains unknown. However, Huntress and Boy Wonder will fight for him. 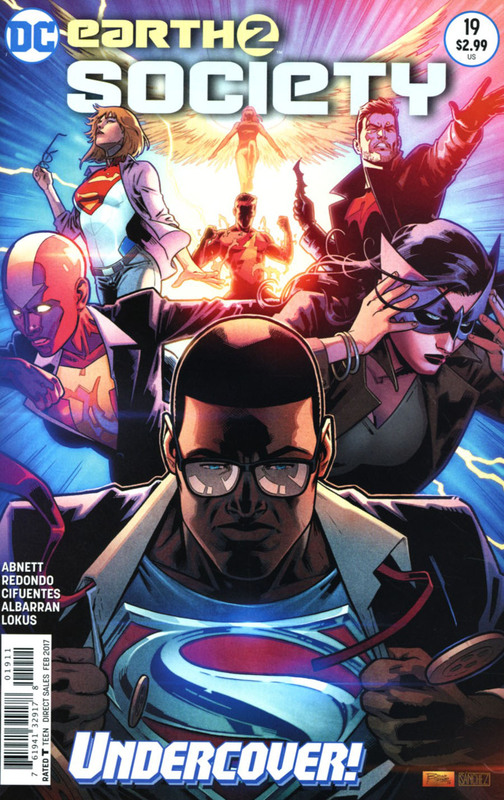 Power Girl, Hawkgirl, Fury, Red Tornado, the Flash and Superman are in civilian disguises observing Metropolis until an army of Wesley Dodds' Sandmen attack them. The director of Central Control, who is really the Ultra-Humanite, doesn't want any Wonders to survive on his new wold because he arrived first. How will Earth 2's heroes make it out of this new peril in one piece? Story - 4: Once again, we have great story that merits a five but Dan Abnett is dragging it out. Perhaps this was done to pander to the trade and hardcover market, or it was possibly an editorial decision. In spite of prolonging this arc, however, this issue was fun to read. Dan Abnett is still one the best writers in comics out there. Art - 5: Bruno Redondo is a name everyone should look out for. His art is stupendous, and every image seems to leap off the page. I've only seen his work in this title, but I hope to see more comic books drawn by him. Cover Art - 5: A darn superb cover. 'Nuff said.